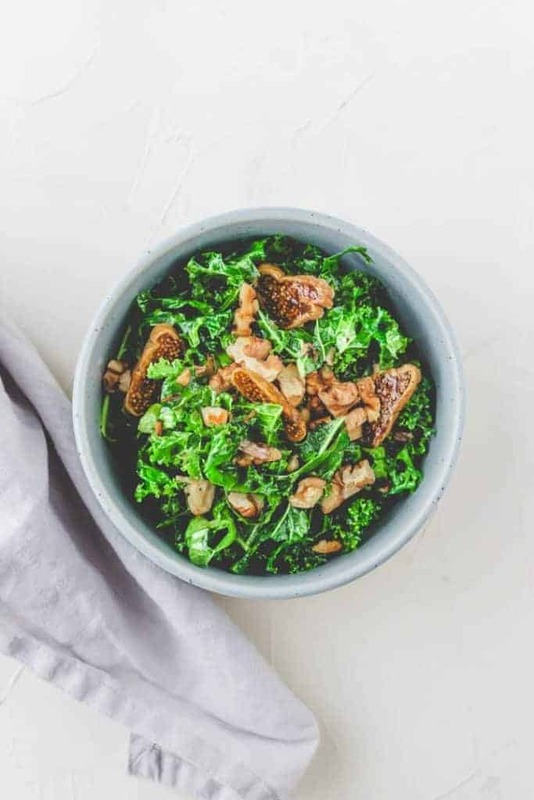 Delicious and healthy vegan raw kale salad with a homemade dressing, roasted walnuts, and figs. This winter salad is a perfect starter or can be enjoyed as a low carb dinner dish. 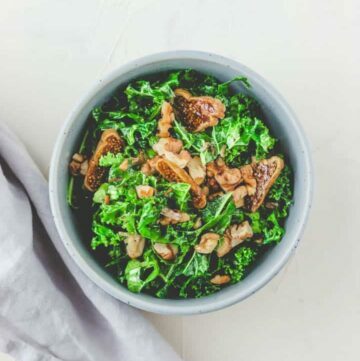 This vegan kale salad is super easy to make and can be enjoyed as a healthy weeknight dinner or as a starter. 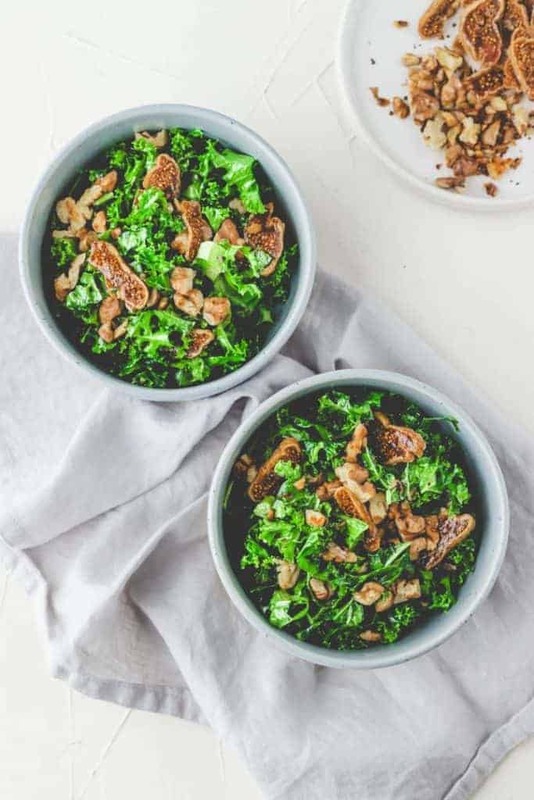 Roasted walnuts give this raw kale salad a winterly nutty and crispy taste. Topping it with sliced dried figs not only leaves a sweet note but also makes this winter salad to a slightly more nutritious meal. Raw kale is low in calories and full of nutrients. One of the healthies vegetables you should eat during winter, when it’s in season, to stay fit in the cold time of the year. If you want to know more about the benefits of kale, make sure to check out this guide. Wash and chop the kale. 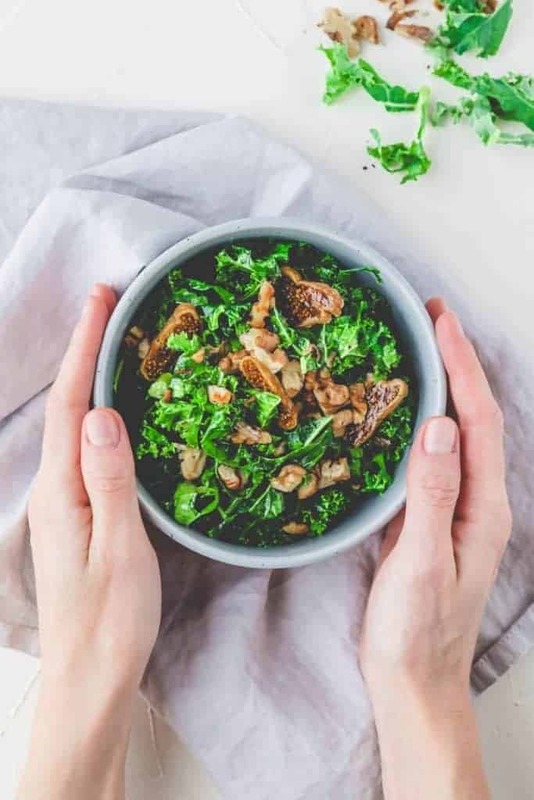 Massage the kale with the dressing using your hands. Serve it immediately or leave it up to one hour in your fridge to soften. A very easy lightly sweet dressing is one of the best for kale salad. With just a handful of ingredients you can make a delicious kale salad dressing. Variations: Use honey if non-vegan. Use red or white wine vinegar instead of apple cider vinegar. Add minced ginger. Mix all ingredients for the dressing. Wash and chop the kale, pour the dressing over and gently massage it with your hands. Set aside. Chop the walnuts and roast them in a pan for a few minutes until brown. Cut the figs into strips. Add the walnut and figs and serve immediately or wrap and place in the fridge for one hour until softened. The serving is for two people as a starter or one person as a light main dish. Use fresh figs if in season.